Actually this is the CD I preferred of the new lot of Decadance Records' new releases. Classical pianist and mezzo soprano singer, Nadia Sohaei collaborated in the mid 90's with Trans-X and then started to compose soundtracks under her name and then with the Thai-Essence moniker. The solo project and TALKING TO MYSELF started to take form with the help of Nik Wejedal who joined her in 2007. Mixing orchestral arrangements, synthpop melodies and bumping rhythms Nadia Sohaei is able to convince electro pop lovers thanks to her vocal abilities and also thanks to the personal mixture of decadent atmospheres and electronic catchy sounds. Mid tempo seducing atmospheres and danceable tunes alternates creating a nice mix. Blinking an eye to the lovers of modern synthpop with electro e.b.m. influences (see Ashbury Heights) Nadia Sohaei adds to the palette her classical past experiences and a touch of drama that help spicing up the formula. Despite the cover (which didn't give me the idea of the music) Seven Octaves' album SIMPLE WORK amazed me thanks to its freshness and to its particular mix of techno and 70s electronic music. If you are old enough to remember or if you are a young electronic music freak who likes to dig into the shelves of old dusty record stores (if there are any left), you'll remember those records that mixed jazz, classical and ambient music, everything performed with analog synthesizers. Well, Seven Octaves (a.k.a. Kenny MacKenzie) has the same attitude of those records but he adds also nowadays techno sounds/rhythms and a little experimentation (like on "Phone thing") with melodies that sometimes could sound naive but that express a joy of playing that will affect you. His jazz pianist activity is also showing its influence on his style and on tracks like "Tussle in B minor" or the opening "A minor is such a lovely key" you'll find yourself asking: "are these modern remixes of old Goblin's tunes?". Co-produced by Anna Logue Records, Kernkrach/Hertzschrittmacher and NLW GESTERN is the first Sonnenbrandt full length which has been released on vinyl as well as on CD (and on this format you have four bonus remixes). Active since 2003 the band is formed by three members: Stefan Bornhorst (THE SILICON SCIENTIST, Dreams Encoded, The Convent – synthesisers, programming, vocoder), Jojo Brandt (Voll Wirksam, Liquid Dreams, The Convent – synthesisers, programming, guitars, lyrics, vocals) and his wife Sonja Sonne’ Brandt (lyrics, vocals). They play minimal electro pop with both joyful and dark veins. Analog synths, guitar and female vocals are the band's weapons and they do their best to electrify your room with melodic tunes. The opening "Herz aus geld" is an irresistible German '80s pop tune with upbeat rhythms. Most tunes play around this formula adding sometimes female/male duets where bleeping synths duet with retro drum machine sounds and clean guitar riffs (a little new wave I might add). Tracks like "Was tun" use stops and go and a great choir while it was a surprise to find a surf guitar on "Hollywood". Sonnenbrandt music is definitely pop but it has many shades. This album contains a lot of potential hit singles: one of them is a nice version of Lio's '80s hit "Amoreux solitaires" but I think that their original tunes are far way better. Adolf Filter is a duo coming from Sweden. Active since late 80's in several bands Daniel Persson and Conny Klenze are playing under this moniker since 2004. 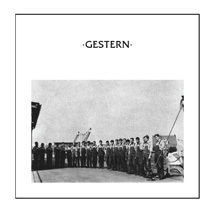 They released a CD-r titled "Status Report" back in 2007 as well as different songs on various compilations ("Festival der Genialen Dissidenten" was one of them). THE OTHER HAND ON THE KNOB E.P. is their first official release for a label and it contains four tracks in balance from dark wave and early e.b.m. (see "Kung i drift"). Keeping a minimal approach to sound the duo tend to create a looping kind of sound where synth pads duet with retro drum machine sounds and samples (like on the instrumental "Landing") where detached vocals help into the creation of a cold hypnotic atmosphere. Check some samples here http://www.enfant-terrible.nl/pe004.htm and mind... this is a 300 copies limited release! Previously active as G.K. Agenda with three tracks released on an Invasion Planète Recordings' compilation titled "Sacrifice Moderne", Nosztalgia Direktiva is a minimal synth industrial project that already released under this moniker a track on the "Festival der Genialen Dissidenten" compilation (issued, like this E.P., on Enfant Terrible). Their self titled 7" E.P. contains four tracks where minimal electronic tunes pair dark atmospheres. Simple but effective melodic lines and analog sounds create the right background for mysterious semi recitative vocals. Nosztalgia Direktiva on "Tegnapok", "Amorphous", "Reflections" and "Néhanapare" are good at creating a mix of electro industrial pop for deviants. Their synths scratch the ears of the listener producing an insane pleasure. Soon available in a 300 copies run. Check three tracks on the label's website.